I'm sure you'd like to see what can you find here on New-Years-Eve.net. On New-Years-Eve.net you are going to discover ... You are going to learn about some countries' New Years Eve traditions, you are going to learn about the usual things they do during their New Years Eve parties, you are going to check out the recipes of their New Years Eve drinks and cocktails (together with some other classics, of course), you are going to learn how people talk about their New Years Eve Resolutions and whether they are able to fulfill them or not!... Oh, you just remembered your 2007's New Years Eve resolutions!? Don't worry, you have still got a little time before 2008. That's not all, though. New-Years-Eve.net won't be just an informational website. We have made arrangements for two wonderful New Years Eve Tours on the site! That’s right! 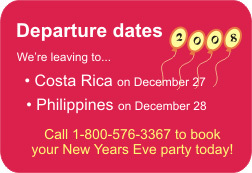 This year we are offering tours to Costa Rica and the Philippines to welcome 2008! So why don't you grab your passport, (need one? 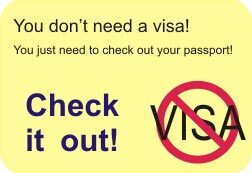 go to us-passports.com) and book your flight quickly. Note: This website uses some Creative Commons contents. New-Years-eve.net thanks Van Robin, Tammy Green, Alisdair McDiarmid, Rick, Rian, Darwin Bell, Albert Lam, Steve Evans, Mary, Aby Arabit, Christina Rutz and Loveme.com for the images provided. Some rights reserved. © 2007 copyright New-Years-Eve.net. The texts on this website are intellectual propety of New-Years-Eve.net. All rights reserved. That said, we are here to provide you one of the best New Years Eve parties of your life.